Ayaw ko na maging mahalaga. Ang gusto ko ay mahalin. Ang kailangan ko ay mahalin. These are words by Juan Miguel Severo, whom you may know as Rico, the poetry-spouting best friend of Albie Casiño’s character Jigs on On the Wings of Love. The 27-year-old actor is a spoken word poet IRL whose performances have been making the rounds on social media, breaking countless hearts in their wake. 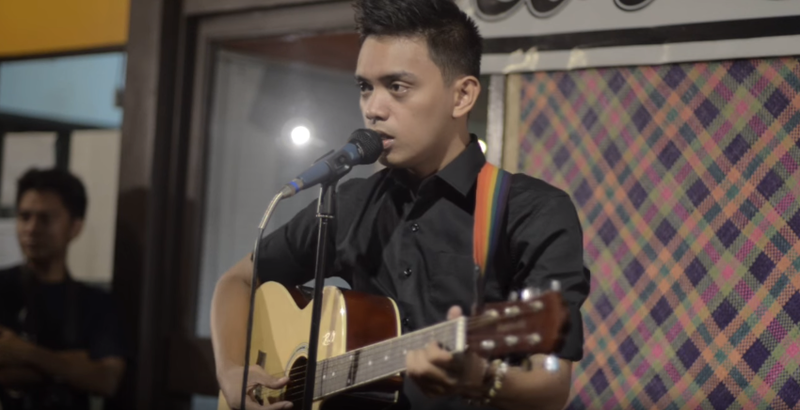 Want even more of Juan Miguel’s brand of hugot in your life? Watch his performances of “Mga Basang Unan,” “Naniniwala Ako,” and “Isang Letra,” you masochist, you. On OTWOL, Juan Miguel’s character Rico is also a poet, although Rico’s poems are “more structured and more measured,” as he reveals to Inquirer.net. He was initially brought in as a writer for the series by his friend, OTWOL director Antoinette Jadaone, but was later offered the role of Jigs’ wordsmith friend—a refreshing addition that gave viewers even more reason to love the Pinoy rom-com. On the show, Rico can be seen performing his pieces onstage at a bar; sometimes, montages of the characters would play out as he delivered his piece. All four of the poems he has performed on the show so far—“Sampung Bagay na Natutunan Ko sa mga Umiibig,” “Ang Mga Lugar Ay Pawang Mga Lugar Lamang,” “Para sa mga Tawa” and “Kapag Sinabi Kong Mahal Kita”—have trended on Twitter. Besides acting on OTWOL and performing his pieces at venues across the metro as part of the spoken word collective Words Anonymous, Juan Miguel is also a playwright whose debut play Hintayan ng Langit made it to the Cultural Center of the Philippines’ Virgin Labfest last July. Like Juan Miguel’s Facebook page to find out where he’s performing next. To read his random musings, follow him on Twitter and Tumblr. And to hear his music, go to his Soundcloud. “What,” you say, “he makes music, too?” Yes, he does. This guy is a true artist.